When you hear of Oxford, England, you immediately think of Oxford University. Located on the Thames River, there is more to this historic city than this prestigious university! Oxenaforda, or ‘Ford of the Oxen’, was settled around 900 AD as a river crossing for Oxen. Soon, the settlement became a military installation. In spite of being raided by the Danes, damaged during the Norman Invasion, the town flourished and adopted a city charter in 1191. The university is first mentioned in the 12th century, however, there is no known establishment date. It quickly expanded in 1167 when Henry II barred students from attending the University of Paris. Throughout the years, British rulers used Oxford as a type of safe house. Charles II escaped London during the Great Plague in hopes to avoid the disease. While the scholars and the townsfolk haven’t always gotten along, it has been home, if only for a short while, to numerous British prime ministers and other international leaders, scientists, writers, philosophers, and so much more. From Margaret Thatcher to Hugh Grant, the list is long and far-reaching. With its extensive history, it is no surprise that Oxford has even produced 12 saints! Oxford has long been the home and inspiration to many famous writers. 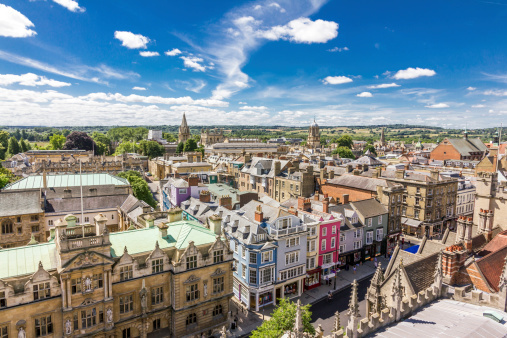 In 1866, poet Matthew Arnold wrote Thyrsis where he referred to Oxford as ‘that sweet City with her dreaming spires’. With good reason, the saying stuck. While there is a lot more to the city, it is largely dominated by one of the oldest universities in the world. Arnold’s spires referred to his view from Hinkseys Hill overlooking the skyline dominated by the towers of Christ Church Cathedral and Tom Tower. The view from Hinkseys Hill has changed throughout the years that have since passed, the sentiment remains. AESU offers several trips to England, including Cosmopolitan, Explorer, Euro Focus, Great Escape, and Euro Spree. If you have any questions or want help booking your Oxford adventure, please contact AESU by calling 800-638-7640 or fill out the contact form found on our website. This entry was posted on Thursday, August 13th, 2015	at 3:14 pm	. You can follow any responses to this entry through the RSS 2.0	feed. Both comments and pings are currently closed.